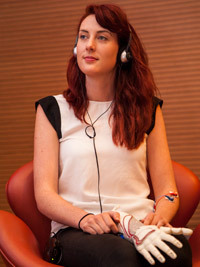 Samantha Payne is co-founder of Open Bionics – an award-winning start up based at the Bristol Robotics Laboratory at the University of the West of England – which develops low-cost bionic hands that look and feel good, for amputees or those born without a hand. The company won a $250,000 cash prize at the finals of Intel’s ‘Make it Wearable Challenge’ in 2014 and is now part of the Disney Accelerator, powered by Techstars. Samantha regularly speaks at international conferences, recently representing women in tech at events in Brazil, Russia and Singapore, and she has just been named as one of the Top 25 Women in Robotics You Should Know about by Robohub. Before starting with Open Bionics I was working on a project called Girls Making History. 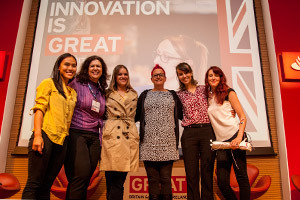 It was a project that aimed to work with young girls and women who had experienced domestic violence and abuse to co-create a piece of wearable tech that would help prevent other young girls from entering abusive relationships. During this project I worked alongside 14 young women who used their combined experiences to solve a problem by creating a piece of technology. The co-design and co-creation element of the project got me very excited about solving problems from the ground up. I spotted this same method in the 2013 Indiegogo crowdfunding campaign, The Open Hand Project. It was about an engineer who was speaking to amputees and putting their needs first by creating an open source piece of technology that solved problems for them. This co-design and open approach of development really attracted me. 3D printing is quick and inexpensive so we would be able to re-design ideas and prototype rapidly, including feedback from amputees as we developed. I met up with Joel Gibbard, the Open Hand Project’s founder, and said I wanted to help. 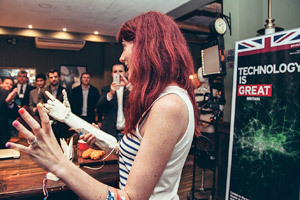 We decided to enter Intel’s Make It Wearable competition as partners and launched Open Bionics there in 2014. The main attraction of 3D printing in the health sector is the accessibility and affordability. Desktop 3D printers are becoming easier to find in maker labs and schools, and 3D printing materials are cheap. There is potential for cities and remote villages around the world to use 3D printing to print prosthetics for amputees that might not otherwise have access to them. I love that a hand design we uploaded to our website from the UK was 3D printed by a maker in the U.S. for a marine who lost his limbs in Afghanistan. It’s amazing to see amputees and makers download and experiment with our designs. Hands we’ve designed have been downloaded and printed all over the world including, Scotland, Canada, the Ukraine, USA, and Mexico. We also know of two academic papers that have used Open Bionics hands to contribute to award-winning research in the medical space. Our open source designs are helping people in ways we hadn’t even thought of. There are lots of challenges with bionic prosthetics. The first challenge we wanted to tackle was the price. Bionic hands can cost anywhere from $30,000 up to $110,000. The people I’ve spoken to who have been lucky enough to get one of these bionic hands have spent $80,000+ for it. That price puts this incredible tech out of reach for the majority. We set out to create a bionic device with high functionality for a low-end price. 3D printing enables us to be able to offer a hand comparable to the high-end devices for around $4,000. The other challenges we’re working through are fit, weight, speed, and power. Amputees have individual needs but a comfortable socket fit is the highest priority, as is the weight. If the hand is too heavy or doesn’t fit quite right amputees won’t wear the device. Similarly, if the fingers take ages to close the experience will be frustrating for the user. But, if you want strong motors they usually weigh more and move slower than light-weight and fast motors, so you have to carefully pick your battles. Working closely with amputees and lots of user-testing is how we’re trying to create the right compromises. We seek out relationships with corporations like Disney because we want to be able to offer the best devices for our users. We’re living in a time when it’s fun to be different. We all want to be unique and show off our own personalities. It’s very different to the conservative past where the majority wanted to blend in. We realised just how boring conventional prosthetics are when we went to user test with a young quad amputee. This young girl was adamant that she wanted a blue ‘Frozen’ hand. The more we spoke to young amputees we realised just how much they wanted to be ‘stared’ at for the right reasons. Older amputees also told us of bullying that went on at school and how even into adulthood they would catch people staring as they walked down the street and then quickly look away. 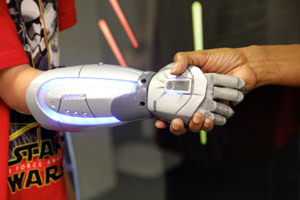 How cool would it be to use their prosthetics to start a conversation? So the people staring stop and say: that’s really cool where did you get that from? That’s why we teamed up with the guys at Disney, Marvel and Lucasfilm. 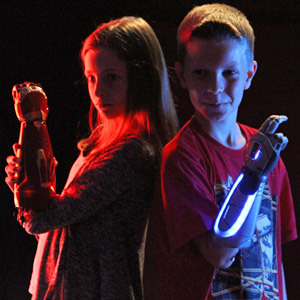 We wanted to start a conversation and we wanted young kids and adults to be able to have hero bionic hands from their favourite movies. We also wanted to play with the idea of ‘disability’ and ‘ability’. What would happen when you create a bionic hand that can offer similar hand functionality and a different set of functions? What if you had a hand that could charge your mobile, play music, and light up like a torch? Would you be considered ‘disabled’ or ‘superabled’? We love the ideas of giving young amputees superhero hands with super functions. 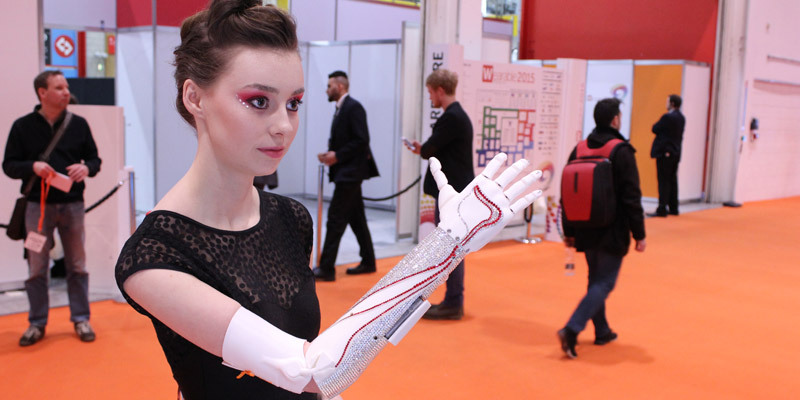 Open Bionics is now the only prosthetics company to hold the official licenses for Marvel, Lucasfilm, and Disney inspired bionic hands. It has been incredibly important to have Joel as my co-founder. 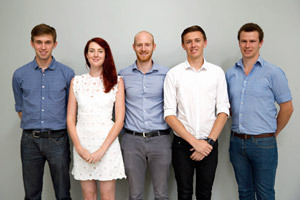 We started Open Bionics as a two person team that grew to six people. 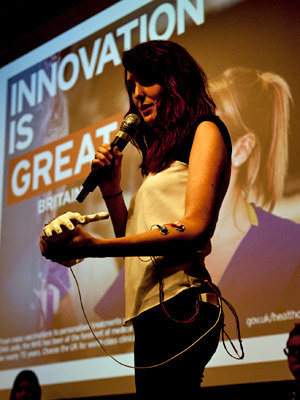 When we started Open Bionics we were both wearing many different hats from developing prototypes, competing for grants and competitions, trying out user-testing, to developing a business and financial model. We’re both transitioning at the moment from a two person team very much involved in the development to the more traditional founder role where we set out the direction and shoulder the responsibility for the team. When you’re the first to try something there’s a lot of pressure from competitors, and your community who’ll have wanted your technology yesterday. You’ll feel as though the whole world is watching and waiting on you, and you can’t move fast enough. Don’t worry, a lot of founders and entrepreneurs feel that pressure, just keep an eye on your roadmap and work through it. My other comment is to speak out about sexism when you see it. I’m often at tech events and conferences where there are very few female speakers even though I know there are lots of women working in this space. It’s only by making noise about institutional sexism that we’re ever going to get anywhere. Women deserve the same opportunities as men and I haven’t seen that offered in the tech industry. We’re focused on user-testing and development at the moment. We hope to launch our bionic hands next year, including our Disney range! In the future we see ourselves developing other assistive robotic technologies that are affordable and tackle mobility issues. There are over 11 million amputees worldwide. It’s a global opportunity to do some good. Once we’ve launched our bionic hands we’ll begin looking at other applications for our robotic technology, such as hand paralysis.